There are a number of email clients provided by different organizations. Nowadays Outlook is one of the common and popular email platforms for sending and receiving email messages. There are a number of features supported by DreamMail but still many users want to switch from DreamMail to MS Outlook. Users are attracted to MS Outlook by its user-friendly interface and many additional features in Microsoft Outlook. So, there is a great need to export DreamMail to Outlook. In this article, we will discuss on same. 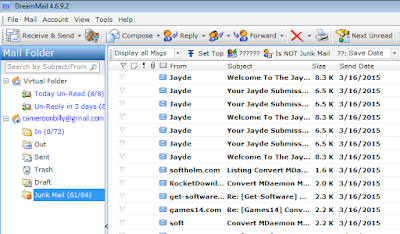 DreamMail is basically an emailing program by a Chinese company ‘DreamSoftware studio’. It supports features like sending and receiving of email messages, data compression, edit received messages, supports eSMTP, SSL, SMTP & POP protocols, support Hotmail and Yahoo email accounts, automatic removal of unwanted or spam messages, etc. It allows management of multiple users/accounts, it manages message rules i.e. whitelist and blacklist, online preview of messages, etc. 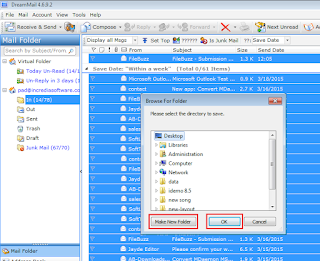 DreamMail makes use of files with .eml file extension for saving the mails one-by-one. MS Outlook is a personal information manager by Microsoft. It is more than an emailing client. It supports features like emails, calendars, journals, task manager, contact manager, web browsing, etc. It supports POP and IMAP protocols that can keep your data on your system as well as on cloud. Outlook makes use of PST files for saving complete email data. One can access his emails in the computer, mobiles, tabs, etc. "DreamMail doesn’t support IMAP email configuration. I want to work online as well as offline. So I need my account to be synced. I wish to move my DreamMail email data to Outlook as it provides numerous features like IMAP configuration, contact and task manager, etc." 1. Open your DreamMail’s email account by clicking on Start >> All Programs >> DreamMail application. 2. Now open your email account in DreamMail. 3. 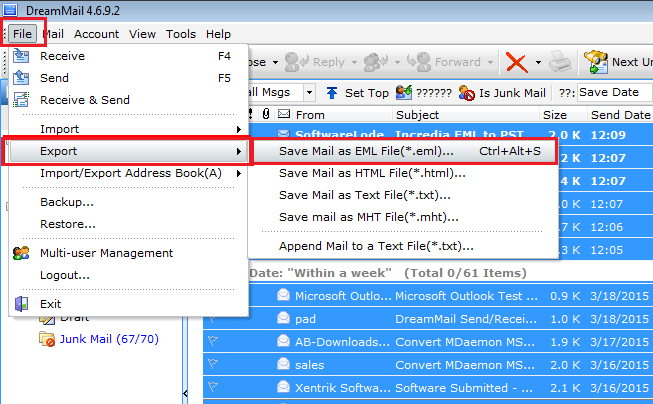 Now, click on the folder to export DreamMail to Outlook which you want to migrate. Save all the email messages by pressing Ctrl + A. 4. Then click on File >> Export >> Save as EML file (.eml). 5. Now browse the location where you want to save those EML files. You can also create New Folder in the desired location as shown. Then click on OK button. 6. 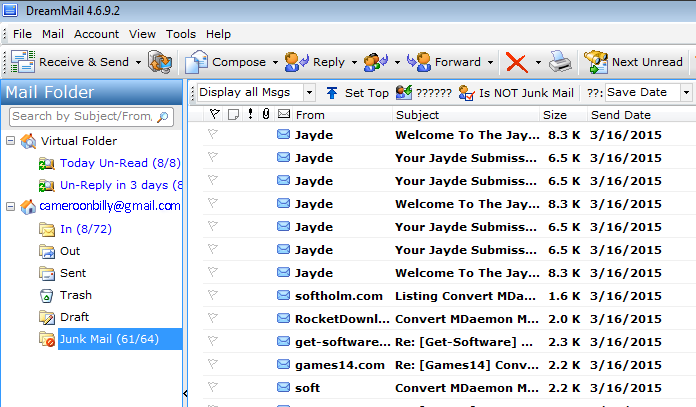 You can see all the email messages in EML format in the saved location. 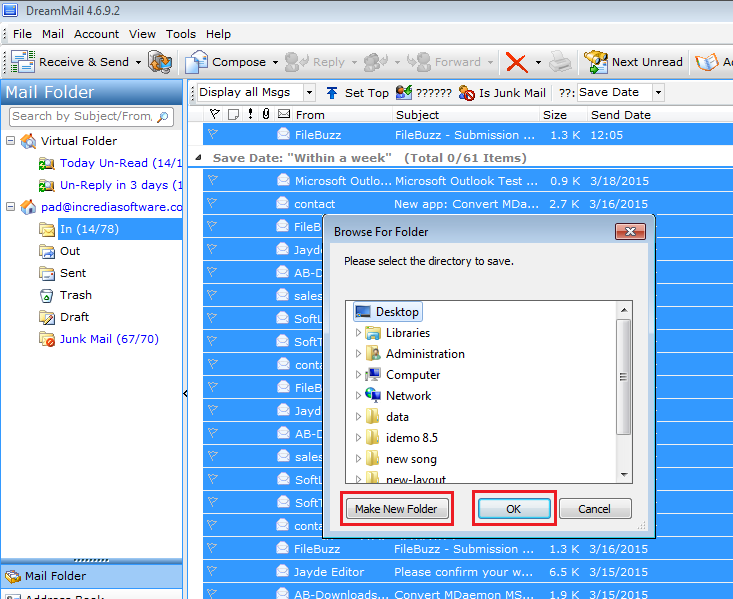 As said, it is a two-step process but there is no direct method to export DreamMail to Outlook. MS Outlook deals with PST file format and cannot import EML files directly. 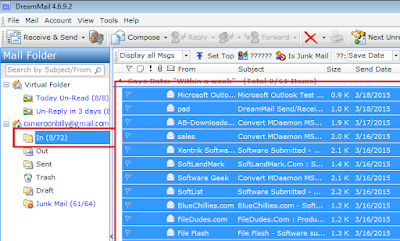 It is easy to extract emails from DreamMail by following above steps. For the execution of second step, one can convert EML to Outlook with the help of an expertise solution that can move DreamMail EML data to PST effortlessly. 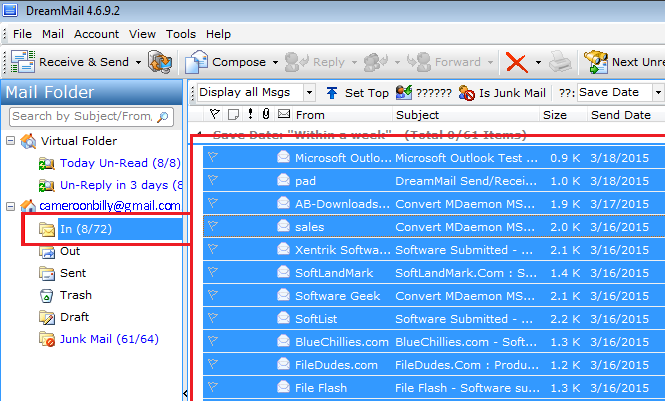 So, if any user is really keen on exporting his emails from DreamMail (EML file) to Outlook (PST file). It is necessary to know the basic functionality and features of both the email clients. One should know the need of migrating their data to another email application. A user can use above solution to bulk export DreamMail to Outlook and move their EML messages to MS Outlook easily.